5 STARS “Piss-your-pants funny. A must-see show.” From creators of sold-out shows Blindside (5 STARS - CBC), Little Orange Man (5 STARS - VUE Weekly) and Snack Music (5 STARS - CBC). 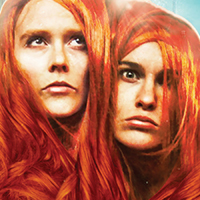 Fallen from fame, two sisters will stop at nothing to present their ‘Ultimate Piece of Art’. This vivacious romp will charm your pants off, leaving you stunned and hungry for their return. This is a reprisal of last year’s smash hit. I really didn’t expect them to have time to put together something totally new, as ‘sister’ Stephanie Morin-Robert was busy with another major production, a beautiful, five month old baby girl with partner Jamesy, from the beloved James and Jamesy duo. She is adorable, and favours her mom. The show was worthwhile seeing again, as they bounce off the audience and play with written suggestions from us, so each show will be different. Plus, not everyone got tuned into just how special these gals are last year, and had a chance to take them in. I love their choice of music, from the intriguing reggae intro, to their theme “I Love My Hair”. They are out playing with the audience pre-show; and continue to bounce off, and in some cases harass their audience. The old Fringe trick of not sitting in the front row will not save you; as they crawl all over the theatre and the crowd throughout the show. They work so seamlessly and gracefully together; like two parts of a whole. They obviously have dance backgrounds, as each movement is so precise and perfect. This is a very fringey show, weird, wacky and wonderful. They are very strange, yet manage to be heartwarming at the same time. Their synchronization makes you believe they are sisters. Their interaction has the teasing warmth and, yes, brutality, that really close siblings can have. If you don’t know what a merkin is, look it up before you go. You will never look at hair, or sweaters in the same way! This show pushes the edge, so if you are really prudish you may be offended. One part had us literally gagging. You will also never get to see Riverdance performed by puppets in bathing suits! This may be your last chance so don’t let yourself down and miss it! The gals are also busy putting on other intriguing shows at this year’s Fringe, so check them out in their many different formations!